Refinishing is a great process if it is done with the right materials and techniques, but all bathtub refinishers are not the same. Before you choose a refinisher, compare what you get with a professional Miracle Method refinisher! The longer a bathtub refinisher has been in business, the more likely he knows what he's doing and will deliver good quality work and service. Miracle Method has been in business for nearly 30 years. Is the company a part of a national franchise or organization? Miracle Method requires its franchisees to attend standardized training and to adhere to defined quality standards. Independent refinishers are accountable to no one. How informative and committed is the refinisher? A professional bathtub refinisher should be able to provide helpful information about his process and what you should expect the finished job to look like. Does he offer videos or a website to help you through the decision process? Does he have professional brochures and marketing materials? Does he have a Yellow Page ad? Do his workers wear uniforms and drive vehicles featuring the company's name? Check with reporting companies like the Better Business Bureau or Angie's List to see what experience past customers have had. Ask to see surveys or responses from satisfied customers. Most Miracle Method franchises are listed with the BBB. Click here to check a Reliability Report. What materials and procedures will be used? Refinishing is a great alternative to replacement if it is done with the right materials and procedures. So how do you know? Here are some key points. The key to good bathtub refinishing is getting the new finish to "stick" to the old surface. Ask about the refinisher's technical process. What is the exact procedure used? Do they acid etch? Do they use a bonding agent? What kind of coating do they apply? Any bathtub refinisher using acid to etch the surface is using old and potentially dangerous technology. Miracle Method does not acid etch! We use a proprietary bonding process, which has proven to provide better results over time than acid etching. Click here to read about chemical bonding versus Acid Etching. The long-term appearance and feel of your refinished surface will largely depend on the top coating that is applied. Epoxy is old technology. It is very durable, but it tends to yellow and turn chalky in appearance over time. Miracle Method uses only acrylic top coatings. Ask how long it will be before the fixture can be used again. The best top coatings will dry in 24 hours or less, which minimizes the time you will be without the use of your tub. In most instances if a refinisher tells you it will be longer than 24 hours, this indicates that cheaper or inferior materials will be used. "You get what you pay for" is very true with refinishing. A professional refinishing job will save you time and money. A poor refinishing job can cost you extra time and money along with a large dose of frustration. The cost to refinish a residential tub can range from $475 to $675, depending on location and condition of the tub. Before taking the lowest bid, make sure you ask all these questions. You will "get what you pay for" with refinishing! Have you seen samples of the work? If the refinisher has a showroom, go by for a visit and check out samples of the work. If he does not have a showroom, ask if there is somewhere else to see his work. Ask to see a sample of the finish. Is the refinisher licensed and insured? Anyone entering your home to perform work should have a business license with the state, as well as liability insurance and workers compensation insurance for their employees. If you work with a refinisher who is not licensed and insured, you may have little recourse in the event you run into problems. Miracle Method franchisees are required to be licensed and insured. Does your refinisher offer a warranty? A professional refinisher provides a warranty. Remember that the warranty is only as good as the refinisher doing the work. That is why you need to pick a reputable refinisher. Ask specifically what the warranty covers and get it in writing! It should at least cover failure of adhesion and peeling. Beware of warranties that are pro-rated or not transferable. Think twice about a refinisher who is offering a warranty for a period of time longer than he has been in business. "Lifetime" warranties should raise concerns. Click here to read about the Miracle Method Warranty. Where did the refinisher receive his training? 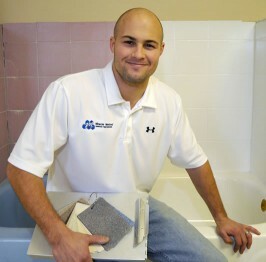 Bathtub refinishing is a trade or craft that must be learned and practiced. Beware of a refinisher who has taught himself or received training from a video obtained over the Internet! A professional refinisher should have personally attended a training course over several days. The more complete the training, the more likely he will deliver quality work. Miracle Method franchisees must complete a mandatory initial training course, as well as continuing education sessions.